I did two new things tonight. One I found on my new iPad while searching around for recipes to use my abundance of greens I have gotten from the CSA. It is called chard and white bean stew. I followed the recipe pretty closely. I don’t like wine so I just used chicken stock instead of wine. I served it over rice in a bowl with garlic toast on the side. It came out amazing and the fresh vegetables in it were just amazing. I used up the last of the carrots I got in my box last week and the Swiss Chard I got in the box this week. I used some kidney beans as well as white beans because, well I didn’t have two cans of white beans in the house! Today was a fun day watching movies and making soup. 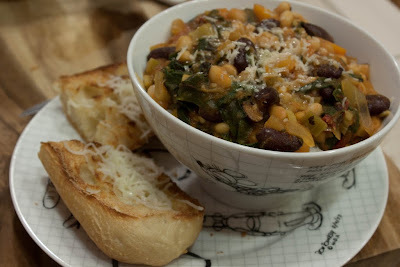 Chard and white bean stew Adapted from Smitten Kitchen! Put a medium pot of salted water on to boil. Chop the swiss chard after cleaning it and cook for 1 minute in the salted boiling water. When a minute is up, dump the swiss chard into a colander and let it drain and cool while you make the rest of the stew. Heat the olive oil in a dutch oven on medium heat. When the oil is warm, add the carrots, onion, celery and garlic to the pan. While this is cooking down, open the cans of beans and stock and tomatoes to get them ready to go into the stew. Rinse the beans under cool water. When the onion mixture is sweated down (about 15 minutes) add the chicken stock. I let it cook for a few minutes then added the beans, tomatoes, salt, pepper, thyme, bay leaf, basil, and red pepper flakes. Bring it to a boil and let it cook for 20-25 minutes (I put the rice in the rice cooker on quick cook at this point and just cooked the stew until the timer went off on the rice cooker.) After the time has passed, give the swiss chard a squeeze to get rid of the rest of the water, and add it to the stew. Cook for about 5 minutes more and serve over the cooked rice and top with some parmesan cheese. I made some garlic toast to go with it as well. I didn’t top it with Sherry vinegar as in the original recipe but the poached egg looks like it would be good. I am going to try that tomorrow. Her photos came out much prettier than mine but I was working on getting awesome photos of the cupcakes and I was starving so I just got one quick photo of the stew. I am going to write up the cupcakes as a separate post because it is going to be super long and involved. Posted by galadriel07 on March 13, 2011 in General Food, Meals! We finally have been home long enough for me to cook something! I was so excited because I have had my Caribbean Blue Lodge cast iron dutch oven here at the house waiting for me to bake some bread in for like 3 weeks. It was calling to me so I started on the bread the night before last. An enamled cast iron dutch oven with a tight fitting lid yields the best results, but the recipe also works in a regular cast iron dutch oven or heavy stock pot. Use a mild flavored lager, such as Budweiser (mild, non-alcoholic lager also works – I used Corona and Heineken – both came out really good) The bread is best eaten the day it is baked but it can be wrapped in aluminum foil and kept in a cool dry place for up to 2 days. I also made some soup from my Rachael Ray cookbook. I changed a few things tho. Add extra-virgin olive oil to the pot, 2 turns of the pan. Add garlic and crushed red pepper flakes, stir then stir in the onions, carrots, celery and zucchini. Cook 10 minutes, then add in the stock, tomatoes and beans. Bring soup up to a bubble and season with salt and pepper, to your taste. Simmer 5 minutes. Turn off the heat and wilt the basil into the soup. Ladle up the soup and serve with grated cheese and bread. My in-laws loved the bread so much that my mother in law told me to make some more for her today. I mixed up the dough last night and am working on the 2nd rise right now. I recommend doing 2 loaves at a time because the bread is so damn good that it goes really, really fast. I hope everyone enjoys these two recipes. I had lots of fun making them and I hope to keep trying new breads soon! Posted by galadriel07 on May 27, 2008 in Meals!, The Bakery!